← The N.J. Tree Foundation Needs My Vote – And Yours! Do You Have an Irresistible Urge to Buy Bread and Milk? 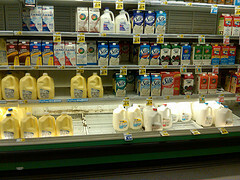 Overrun with near-panicky shoppers with one mission: buy bread and milk. Today it’s snowing. Yesterday my local ShopRite food store was overrun with shoppers. People of all shapes and sizes and ages parked their cars crooked in their parking spaces in the lot and raced for the entrance to the food store. Northern New Jerseyans racing to purchase bread and milk because a snowstorm was predicted for today: 2”-6”, one-fourth what we received in the recent blizzard. Now I don’t know how people react to news of an impending snowstorm where you live, but here in Northern New Jersey the announcement is followed by an insatiable need to drink milk and eat bread. Weird, huh? When I was a kid and the only 24-hour business was the local hospital, we did have to plan our food shopping with weather in mind; we had to figure out the food we wanted to eat and make sure we had it in the house. Strangely enough, though, even when I was a kid bread and milk were the first products to fly off the food store shelves. Personally, I think hot chocolate and marshmallows are better “firsts” to purchase at the news of impending snow, but maybe that’s just me. Today many food stores are open 24 hours, and you can purchase bread and milk practically anywhere: the food store, the gas station mini mart, a neighborhood convenience store. We have become a 24-hour, 7-days-a-week society. Planning ahead for anything other than perhaps major sporting events or theater, which cost hundreds of dollars to attend, is a thing of the past for most people. We have become a just-in-time society, and in my town, many people are the 15-minutes-late kind. It flies off the shelves at news of impending snow. 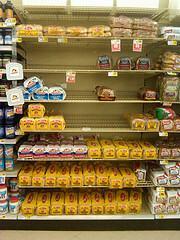 So why then do people still race to the food store to buy bread and milk at the first sign of snow? It’s a mystery to me. P.S. Don’t forget to vote today: http://www.refresheverything.com/newjerseytreefoundation — register yourself then vote for the N.J. Tree Foundation project every day this month. Help them win a grant that will help other schools and organizations in New Jersey refurbish and renew our urban streetscapes. Thank you! come to Maine!! The first things off the shelf are beer and potato chips….and we have grass instead of snow (for now, anyway). So funny and true! I lived in Maine for six years. It would snow a foot and a half every other day. There were no runs on grocery stores. No one became calcium deficient in the winter. Then I moved back to New York, Long Island, and suddenly a forecast of flurries caused panic. People stocked up like the grocery stores would shut down for three years. It was crazy! Hope you’re having a Happy Monday!